The Yampa River through the Dinosaur National Monument has it all! As the last free-flowing river in the entire Colorado River drainage, the Yampa is incredibly wild in May and June. The Rocky Mountain spring run off creates big roaring rapids with an average descent of 12-14 feet per mile. The gradient at Teepee Rapid is an amazing 31 feet per mile! Raft alongside 2000-foot high white canyon walls with black tiger-stripes; hike side canyons to prehistoric rock art and abandoned caves. The Yampa joins the Green River at Echo Park for a 180-degree swing around beautiful Steamboat Rock, and then continues through the canyons and Split Mountain Gorge. The whitewater is exciting and heart pounding while the slower river sections offer spectacular scenery to quiet the soul. Ancient American history and geological features fascinate your thirsty mind; and star-studded nights evoke thought and appreciation for our place on Earth. This trips was featured in National Geographic's "Wild and Scenic Rivers" Book. 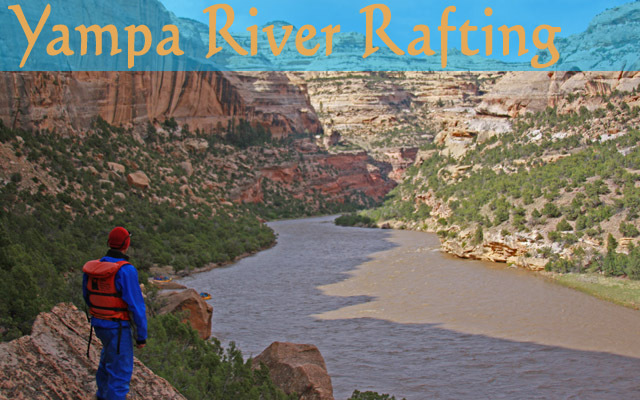 The Yampa River is a guide favorite and is entirely within Dinosaur National Monument. It's the last free-flowing river in the entire Colorado River drainage and is incredibly wild in May and June. The melting snow from the Rocky Mountains creates roaring rapids, with an average rate of descent of 12-14 feet per mile.